By Jeffrey Sonsino, O.D., F.A.A.O. This month marks the one-year anniversary of the launch of UltraHealth contact lens and thousands of patients are now benefitting from the vision, comfort and eye health that UltraHealth offers. As we look back at last year, we heard how practitioners used different ways to successfully fit UltraHealth. We wanted to share some of these methods. They all are based on the same fitting philosophy which is to achieve 100-150 microns of apical clearance at initial fit and then expect 30-60 microns of settling during wear. This will ultimately achieve a fit with 50-100 microns of apical clearance. 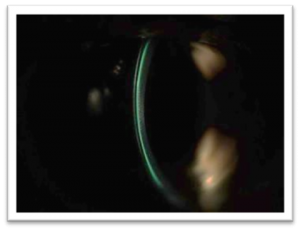 1) Use diagnostic lenses with fluorescein to determine the initial touch of the corneal apex. 2) Use an optic section along with the thickness of the diagnostic lens to determine the amount of apical clearance. 3) Use an OCT to determine the apical clearance. Many practitioners found that the defining step in the initial fitting guide wasn’t necessary and a bit confusing. Why start at 250 vault, go down by 100 vault until touch and then go back up by 50? Instead, use the amount of initial touch or bearing (after clearance is established) to determine the fit. If the initial touch is heavy, then add 150 microns, if the initial touch is light, then add 100 microns. Even though I have a top-of-the-line OCT and an extremely nice slit lamp, diagnostic fitting with NaFl is still my method of choice for evaluating UltraHealth. It is extremely easy and time efficient to insert the lens with NaFl and observe after a short 5-10 minute settling period. Some practitioners prefer to assess the fit using an optic section. 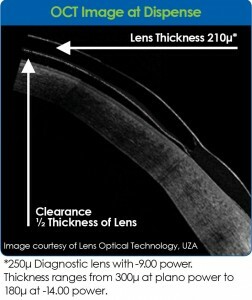 The central thickness of a 250 vault diagnostic lens is .22mm. When assessing initial fit, we look for an optic section above the corneal apex that is about half the thickness of the lens. An OCT can be used to assess the apical clearance at initial fit and at follow-up. This image shows UltraHealth on a keratoconic eye. This is an ideal fit, exhibiting around 50 microns of clearance at the corneal apex. You can also see the inner landing zone, the clearance at the junction and the outer landing zone of the soft skirt. If you are fitting an UltraHealth on a keratoconic patient, please make sure that you are observing the line scan approximately at the apex of the cone and not directly through the visual axis. The vault measurement will be vastly different in those two zones.